This won’t take long – I just need to clarify a few things. Every year, after the Super Bowl (especially when the New England Patriots are involved), I find myself answering the same questions…sometimes to the same people who asked them the previous year. This year I have decided to write the answers down, that way when future interrogatories start I can simply direct the questioner to this post. Warning: If you’re a Patriots fan this post may offend you (even though it shouldn’t). If you don’t like football it will probably not interest you…but then again – it just might. This post is not intended to offend anybody, or start a debate – I posted it strictly in the interest of clarification. I will gladly discuss it with you if you desire, but I won’t argue about it…football just isn’t important enough to me for that. Announcing … that first step towards a print edition! 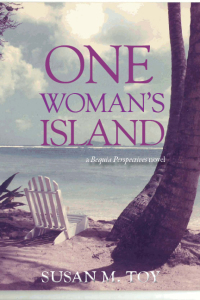 It may not seem like much of a step to you, but I did assign an ISBN this morning for a future print edition of my most recent novel, One Woman’s Island! And that’s cause for celebration in my books! There’s still a lot of prep work to be done on designing and formatting the text, cover – front and back, as well as spine, and the actual printing and delivery … all of which also will cost $$$.